“I can’t wait to lose an hour of sleep!” said no one ever. It’s Daylight Saving Time 2018, and I’m sure a number of us are feeling the effects of losing that one precious hour of sleep. Not only does this mean one less hour of sleep—we’re losing another hour of working on a client’s small business website, a personal project, cleaning the apartment, paying this month’s bills, meeting up with that one friend for lunch though it looks like we’re going to have to cancel again—but we can’t put the blame on DST, now can we? Nope. This is all about time management. Like 99.99% of working adults, I don’t have the luxury of owning just a single title. I’m not just a web designer or a student. I’m also a graphic designer, a writer, a blogger, a photographer, a son, a brother, a friend—and yet I’m somehow supposed to build a strong social media presence through Twitter, Instagram, and LinkedIn, constantly update a web portfolio, search for jobs online, keep up with contact references, schedule appointments, and still manage to keep my head above water? Well, I’ve managed to do all that, but it hasn’t been easy. 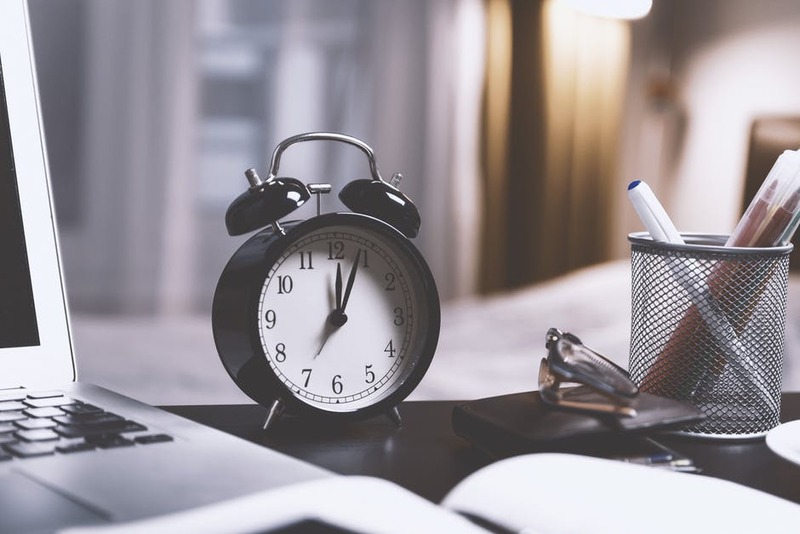 Time management isn’t a skill you learn overnight or a certification you take online courses for through HubSpot Academy. Time management is a muscle you exercise or else it cramps up and leaves you stranded in the middle of the swimming pool. I would say “ocean,” but come on, who has time to swim in the ocean when there are so many projects with deadlines to complete? So how do I balance my life between work and leisure while maintaining my sanity? First and foremost, I acknowledge the fact that I am not perfect. I’m not a sleek android from the not-too-distant future that can type a thousand words per second and build websites like digital origami. I can’t be in multiple places at once when teleportation hasn’t been invented (yet). Don’t forget the sick days, weather emergencies, and flat tires sure to derail whatever schedule I’ve committed myself to in that timeframe. In other words, because I’m aware that I’ll make the occasional error of being human, I allow myself a little breathing room to manage my time well. Now I’m going to break down the major components of my time management success to date. I can’t stress enough how important it is to determine what your priorities are. They don’t just concern your work, school, and family. They concern your health, too. There’s no point in putting work and school before yourself if your health is in dire straits. If you don’t have the mental capacity or physical capabilities to lift a finger, consider the consequences: What if you can’t get a co-worker to cover your part of the presentation? What if you fail to reach a project deadline because you attempted to go without sleep for 50 hours straight and ended up snoozing through an entire weekend? Sometimes we have to push ourselves to keep up and stay productive, but if you can reach the very edge of total burnout without falling over the edge, then go for it, but you’re doing yourself a disservice by risking your health with lack of sleep, poor eating habits, excess caffeine, emotional strife, and so on. Don’t go over the edge of burnout, and your body and mind will thank you for it. By the way, if that cough’s lasted over two weeks, you need to go see a doctor yesterday. Get going! I used to have a love-hate relationship with to-do list apps, and I’m not sure why. If I had to guess, it was probably the fact that most of them required an account just to sign in when all I needed was to jot some words down. For years my preferred method has been pen and notepad, and research has always backed the idea that writing something longhand helps you remember that something better than typing it. However, in recent weeks I’ve returned to apps because I’m on my laptop 90% of my work day, so when I leave a to-do list app open, my tasks are in my peripheral vision and can’t be ignored. Plus, my longhand is basically chicken scratch, so typing my tasks has made list-building more efficient in terms of scannability. The to-do list app I’m currently using is Wunderlist, but I would also recommend Todoist, which has an equally user-friendly interface. Both are free to download for desktop and mobile devices. Last week I bought my first dry-erase calendar board at Target. The board is 30 x 20 inches and can be mounted on the wall, but instead I have it propped up against the wall and sitting on top of my desk. I’m a visual person all around—I learn better through visuals, and if I can draw or write something on a large white board and be able to see it everyday, then it’ll be a great source for what I have planned for the weeks to come. If I have to be honest though, I think I just really like white boards and writing in marker. It’s not much to look at now, but I’m filling it out as I go. I also carry a medium- to small-size notebook planner with me to appointments or to any place where I know I’ll be taking notes or meeting important people so I can write down contact information. Essentially, you should always have a calendar—in some way, shape, or form—on your person at all times to keep track of dates, appointments, and deadlines. I also use the Calendar app on my phone and my MacBook. Which sounds better? Spending twelve hours working on a single project, or spending twelve hours working on twelve different projects? Perhaps the more appropriate question is which scenario sounds the least exhausting. Working twelve consecutive hours on a single project doesn’t just sound tiresome. It also takes time from other tasks you could be working on, like returning a phone call or finishing some logo thumbnails. An ideal situation is to break down the day’s workload and dedicate an equal amount of time to each task. This amount can range from ten minutes to one or two hours, but depending on the tasks at hand, I typically dedicate one hour to working on each assignment. To keep track of the time, I use the Clock app on my smartphone to set up a timer, but for variety I’ve also used Howler Timer, which you can download for free through the App Store. Three words: Know your limits. This sentiment echoes the first tip on this list, but now I’m talking about what you can actually accomplish with the time you have. You can’t change the world in one day, so don’t wake up in the morning thinking that’s what’s going to happen by 5 p.m. With that said, don’t underestimate yourself, either. You’re capable of accomplishing goals, overcoming challenges, meeting due dates, and satisfying clients. Remember how you got where you are today, figure out what worked for you and what didn’t, and go from there. A key component for time management is preparedness. For me, giving myself extra time in between projects allows me to decompress and plan for what’s coming. When I have to travel to an appointment, I schedule an extra hour before the official appointment time (on top of my total travel time) so I can avoid running late due to bad traffic. Be realistic about the time you may or may not have, but plan ahead should an emergency arise. Time management isn’t something I can say I’ve truly mastered yet. Like I mentioned earlier, it’s a muscle meant to be exercised consistently or else it becomes useless. There isn’t a concrete solution to managing one’s time 100%, but I believe time management is as much about confidence as it is preparedness—or better yet, optimism. If you believe something can be done, it’ll get done, even when you can’t see the way to the finished product. But just to be safe, go back and break down the tasks that need to be done today right now. Or you can sleep on it. Yeah. Do that. What time management tips have made you a hardworking success? Have you found any of the tips in this post helpful before or far from it? Share your experiences in the comments section below, and don’t forget to subscribe!